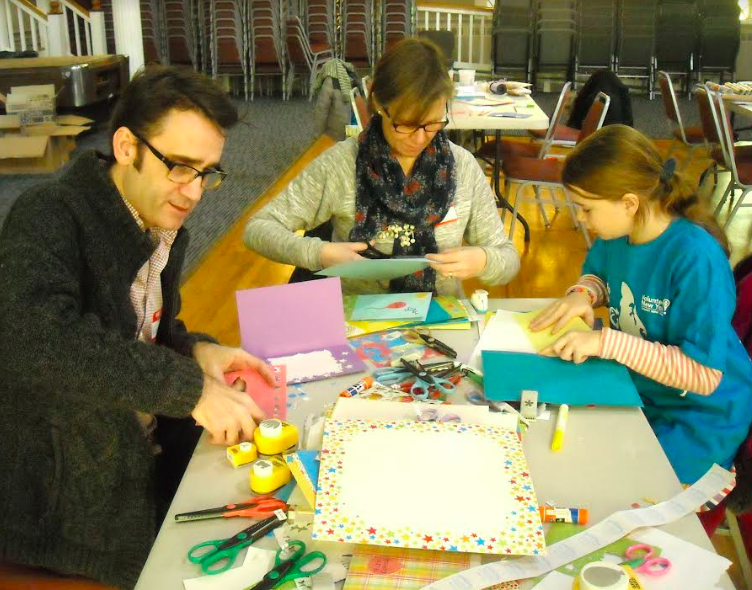 The members of this family of volunteers are busy cutting, pasting and preparing creative cards to be placed in the ‘Birthday Bags for Children in Need’ on the MLK Day of Service at Nyack Center. The community-wide 2018 observance of the ‘Day of Service’ is about honoring the life of Rev. Dr. Martin Luther King Jr. while bridging barriers and overcoming obstacles. This year, volunteer opportunities in Rockland County hosted by Volunteer New York! ranged from ‘Learning Hands Only CPR’ in Spring Valley, to ‘Food Collection and Distribution’ in Congers and to ‘Making Birthday Bags for Kids in Need’ in Nyack. The core mission of Volunteer New York! is to inspire, mobilize and equip individuals to take positive action to address pressing challenges, support nonprofits and improve the quality of life in Rockland, Westchester and Putnam counties. For more than 67 years, the organization has encouraged adults to serve youth to build character, families to bond, young professionals to lead, mature adults to share their wisdom and businesses to engage through volunteerism. National Volunteer Week was established in 1974 and has grown each year, with thousands of volunteer projects and special events scheduled throughout the week. It is an opportunity to shine light on the people and causes that inspire others to serve. Volunteerism empowers individuals to find their purposes, to take their passions and turn them to meaningful changes. In 2009, Congress designated September 11th as a National Day of Service and Remembrance under bipartisan federal law and charged the Corporation for National and Community Service with helping to support this effort across the country. It established the inspiring tradition of engaging in charitable service on 9/11 as an annual and forward-looking tribute to the 9/11 victims, survivors and those who rose up in service in response to the attacks. #Giving Tuesday harnesses the potential of the generosity of people to bring about real change in their communities. It provides a platform for them to encourage the donation of time, resources and talents to address local challenges. It also brings together the collective power of a blend of partners that includes nonprofits, civic organizations, businesses and corporations plus families and individuals to encourage and amplify small acts of kindness. Legislation was signed in 1983 creating a federal holiday marking the birthday of Rev. Dr. Martin Luther King, Jr. and was first observed in 1986. In 1994, Congress passed the King Holiday and Services Act, designating the Martin Luther King, Jr. Federal Holiday as a national day of service and charged the Corporation for National and Community Service with leading this effort. Taking place each year on the third Monday in January, the MLK Day of Service is the only federal holiday observed as a national day of service-a ‘day on, not a day off.’ The MLK Day of Service is a part of United We Serve, the President’s national call to serve the initiative. It calls for Americans from all walks of life to work together to provide solutions to our most pressing national communities, bridges barriers, creates solutions to social problems and moves us closer to Dr. King’s vision of a ‘Beloved Community’. Participation in the MLK Day of Service has grown steadily over the past decade, with hundreds of thousands of Americans each year engaging in projects such as tutoring and mentoring children, painting schools and senior centers, delivering meals, building homes and reflecting on Dr. King’s life and teachings. Many of the projects started on King Day continue to engage volunteers beyond the holiday and impact the community year-round. For additional information, call (914) 948-4452 or visit www.volunteernewyork.org.